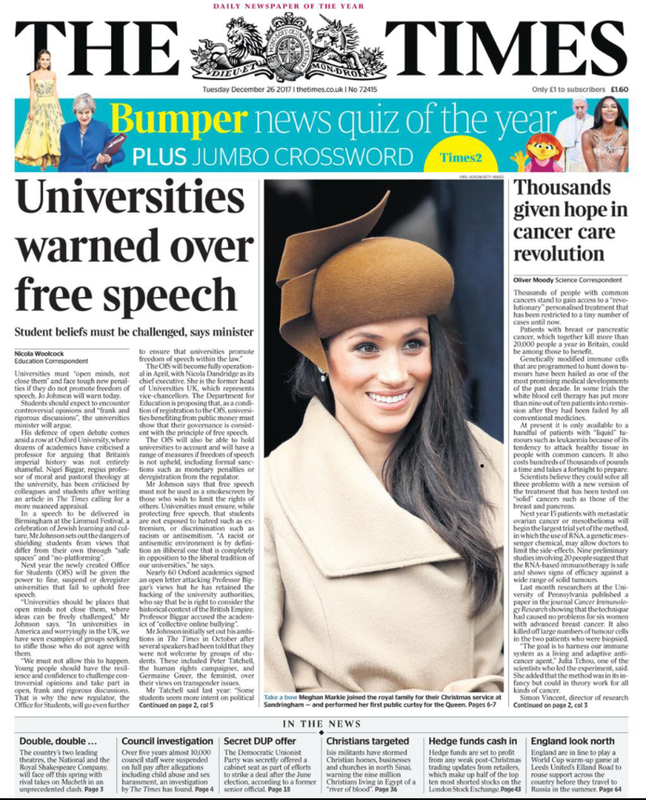 It’s unnerving to wake on Boxing Day to the news that universities are apparently opposed to free speech. It’s frankly alarming when this news is being delivered by the Minister for Universities. Newspapers overnight appeared to rely exclusively on a press release about a speech Jo Johnson would deliver the following day. It was full of broad assertions, with a little bit of balance about Prevent regulations that in fact prescribe limits on free speech when it comes to extremist organisations. By the morning we had Jo Johnson on the Today programme, tossing out some rather wild claims about books being removed from libraries, trigger warnings somehow closing minds, and so forth. Yes, that’s our minister. It is possible that Johnson has a dossier of evidence to support his assertions. If so, let’s hope this doesn’t prove as elusive as those Brexit impact assessments, because every academic in the country is curious. It’s equally possible, though, that the evidence is somehow always over the horizon. Some journalists leapt to an apparent link with the debate raging in Oxford over the research into and teaching of colonial history. But it’s not yet clear that Johnson wants to draw this link himself, however much he might like the feeling of crowd-surfing through a dull news day on the back of it. The simple fact, worth underlining, is that this debate is the very stuff of academic discourse. It’s about the practice and ethics of an academic discipline, not about closing minds and burning books. That’s a critical distinction, and one would hope the minister might acknowledge it. Others reach to a couple of cases that might just about be labelled ‘notorious’, if only because they have been rehearsed in the media so many times. Hence the supposed ‘no-platforming’ of Germaine Greer at Cardiff University, which has assumed near-mythical status. Well fine, but the evidence is not entirely clear; indeed she did eventually give a talk. More importantly, that was an event organised by a students’ union rather than a university, and there’s an important distinction between the two. One would hope that the government does not want universities to interfere in the independent decisions of their students’ unions. Beyond that, the criticism degenerates rapidly into vague suggestions that certain views are not being heard. On the one hand, this misrepresents what actually happens in universities. We’re not like parliament or the BBC, organising the pursuit of knowledge around spurious notions of binary contestation or balance. I mean, is Johnson about to suggest that we invite Nigel Lawson to speak at our climate-science conferences? Nor do we routinely stage public debates that, say, a member of the far right might even want to attend. Such events occasionally happen on university premises, but they are much more likely to be organised by students. And as for those books we’re removing from sensitive student eyes: please show us the evidence. Sensible and committed academics have been on social media this morning, genuinely bemused by this claim. Without evidence, it’s a contemptible insult to people who care deeply about universities. I would be willing to bet that no UK university will ever be sanctioned under the regulations that Johnson proposes. This issue says much less about any real problem than it does about a minister keen to present his right-wing credentials and create an impression of putting universities in their place. But he’s playing with fire. The politics of this debate have been marked out clearly in the US. There, far-right political figures (who of course prefer the term ‘alt-right’, because that makes extremism sound more acceptable) have repeatedly manipulated events to create an impression that universities are censoring them. In fact the evidence is more equivocal. Berkeley, for instance, was prepared to spend millions of dollars on enhanced security so that Milo Yiannopoulos could safely speak on its campus. But – what do you know – he didn’t show. He preferred the ‘censorship’ narrative. So universities are hammered over and again as closed-minded and politically uniform. This plays nicely to a certain audience, but represents a risky positioning of political games over reality. It also threatens to undermine the public status of universities, and in turn their standing internationally. One would hope that similar trends in the US might worry a UK minister, but in this instance he seems happy enough fiddling with his box of matches. There’s also a nasty generational politics at work here. The Today programme interviewer played into this by making claims about what ‘the students’ want – which, listeners were told, was absolutely not free speech. That’s seriously crap journalism. While some students are arguing with passion about particular political and cultural issues, the ‘snowflake’ slur remains a nasty, unsubstantiated political fabrication. So here’s an idea: how about we talk with some students at times like these? How about we not rely on the ventriloquizing of them – the ‘students think’ piffle – of middle-aged men? How about we prepare ourselves to engage with some articulate, intelligent people, who want to change a world that isn’t always working in their interests? The best piece of journalism I read this morning was also about the political corruption of speech, but it had nothing to do with universities. This article, in The Washington Post, was a detailed investigation into Russian interference in Western politics. For anyone who heard Jo Johnson’s brother Boris in Moscow last week, rather illogically arguing that the Russians interfered in the Brexit referendum, but ‘not successfully’, this should be essential reading. So yes, minister, there are reasons to be concerned today about the politics of speech. But before you proceed with this extraordinary assault on universities, it would be nice if you could reveal your evidence, and it would be worth your while to reflect on where this might lead you. We had been led to believe, after all, that you were the Johnson who thought a little about the consequences of his words.